"It may never rain cats and dogs, but fish, shells, and frogs have indeed fallen from the sky on rare occasions. In 1984, live six-inch [15 centimeters] flounders (fish) fell on a London neighborhood. It is thought that a waterspout had lifted them to cloud level from the Thames River, then later dropped them several miles away. The fish were probably as surprised as the people who saw them fall. More recently, the fishing port of Great Yarmouth in Norfolk, England experienced a shower of fish on August 6th, 2000. Similar stories are told of remarkable "showers" from other locations near open water. In one memorable storm in England in 1844, people held out hats to catch dozens of falling frogs. Such small creatures, once airborne, might be carried aloft for an hour or more within the strong updrafts of a thunderstorm. These stories remind us of the plague of frogs that occurred long ago in Egypt (Exodus 8). At that time, however, the frogs came onto the land from the rivers and ponds. This plague was much more extensive than a rare fall of frogs during a local storm." What we are trying to do in this part of our series is to start with the Bible and see how history fits in with what God's Word says. And sometimes it gets amazing. We are going to see how God prepares Moses for his unique ministry based upon the sure Word of God while also looking at possibilities from historical sources. Main Idea: God prepares men and women to serve Him in ways we cannot comprehend – at the time. What Exodus Teaches (Exodus 2:11-15). Moses knew he was a Hebrew (11-12). Moses did learn something about God from his father, for in Exodus 18:3-4, while he was dwelling in Midian with Jethro his father-in-law, he had two sons. We read, "One son was named Gershom, for Moses said, 'I have become an alien in a foreign land'; and the other was named Eliezer, for he said, 'My father's God was my helper; he saved me from the sword of Pharaoh.'" Moses was not afraid to kill (12). Moses was vulnerable to a charge of treason (13-15). Moses knew how to escape (15). What the New Testament Adds (Acts 7:20-29, Hebrews 11:24-26). Decided to visit fellow Israelites (23). He expected his people to rally round him and break free from Egypt (25). "By faith Moses, when he had grown up, refused to be known as the son of Pharaoh's daughter. He chose to be mistreated along with the people of God rather than to enjoy the pleasures of sin for a short time. He regarded disgrace for the sake of Christ as of greater value than the treasures of Egypt, because he was looking ahead to his reward." Made an irreversible choice to identify with the Hebrews. Chose to follow God's way over personal comfort. Main Idea: Moses had been trained to become Israel's leader and one of the great men of history. But he was lacking in one quality: humility. The Moses who was powerful in speech and powerful in action was a different man when he first saw the burning bush. So sometimes God prepares us with information and training, and then breaks us so that we are all the more useful. God prepares men and women to serve Him in ways we cannot comprehend – at the time. What Historical Sources Might Add. Jewish sources (Josephus, about 90 A.D.). Egyptians were in trouble, Nubians/Ethiopian advancing. Egyptian prophets had visions to put Moses in charge of army. Moses used Ibis birds to eat up snakes so army could advance through the desert and surprise the Nubians – successful. 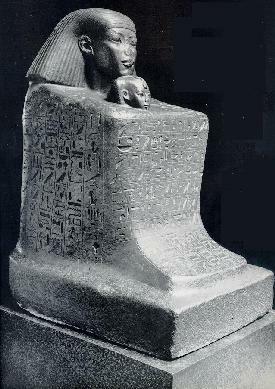 Statue of Senmut and Nefure is not Senmut (a man) holding Nefure (baby), but Nefure (a woman) holding Senmut (baby Moses). Complex Egyptian politics explains much (my interpretation). Tutmose the first started killing the boys born to the Hebrews. Nefure/Hatshepsut hates this, rescues Moses; maybe 13 years old. Her father dies when she is about 15. She marries her half-brother, Tutmose II, who is now a coregent and stops the slaughter; the Egyptians hate her because she loves foreigners and she controls her husband and when her dad dies, the government. Tutmose II dies after only 13 years reigning; Hatshepsut seizes the throne while Tutmoses III, an illegitimate hated step-son (still a child), becomes a coregent without much power; Hatshepsut spoils Moses, and makes him Grand Vizier. She claims she has had visions that the gods want her to be Pharaoh and that her father, Tutmose I, had wanted her to be Pharaoh. In summary, Hatshepsut is in power and wants Moses (Senmut) to be her heir. Her stepson ages, and begins demanding his rightful place as Pharaoh, but is frustrated because Hatshepsut and Senmut have more power. Moses becomes moved to deliver his people, the Hebrews; he begins visiting them more often and trying to rally them. Then Senmut (Moses) mysteriously disappears. A year later, something happens to Hatshepsut -possibly assassinated - and Tutmose III takes the reigns. 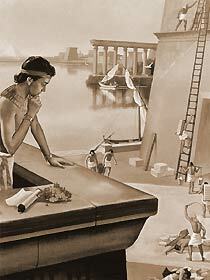 I would suggest to you that this mysterious disappearance of Senumt was caused when Moses killed the Egyptian. He took off, because now Tutmose III would have a pretext to declare him a traitor and seize real control of Egypt. 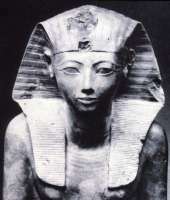 Without Senmut's leadership, Hatshepsut can no longer resist her stepson. After Hatshepsut dies, Tutmose writes graffiti on her tomb and accuses her and Senmut of all sorts of sexual obscentities. which is why some Egyptologists think that Hatshepsut and Senmut were lovers. If my theory is correct, they were simply a stepmom and son very devoted to one another. 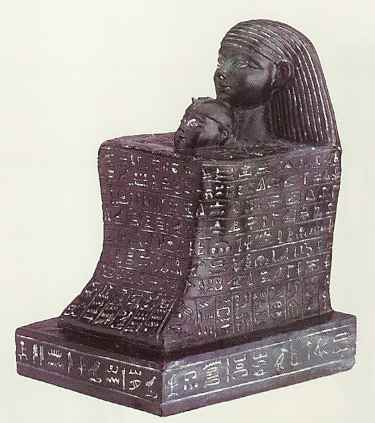 Tutmose III tries to destroy all records of Hatshepsut and Senmut. Many never do what God has prepared them to do. Don't forget to think "Lord willing". Failure can be the back door to success. God's way and God's timing. Note: In 2007, they discovered the mummy of Hatshepsut and determined that she had died of diabetes.